Well this is probably one of the most exciting and busy times of my life! Only a few months are between me and the completion of my lovely home here in The Dartmoor National Park! I arrived here 24 years ago, when I had only a few ponds, fields and lots of old barns, and in only a few weeks I will have seven cottages/apartments, an office/tackle shop, 3 fly lakes with trout above 2lbs, 2 lakes with trout above 3lbs, an adult and children’s float fishing lake, Children’s Play area, a paddock with rare breed chickens and a pub across the road. To celebrate the end of my hard work I will be holding a special open day in May or June. This date will be posted onto my website as soon as the final finishing touches are in place. This open day will consist of a free fly fishing demonstration by a fully qualified fly fishing instructor for all anglers and visitors. Anglers are welcome to bring gents and ladies who do not fish but would like to watch an expert cast a fly! Extra double figure trout will be stocked the two weeks prior to this date and there will also be a free celebratory drink for all anglers and guests at 1pm. Many of the people who have helped me over the past 24 years will be invited for lunch and Champagne on this day. Please watch this space for the date! January saw the fishery and most of the country hit again with bad weather and rain! I even had to move my two goats over to my field near the pub to give them a break from their muddy paddock. January 24th was my Birthday and it was an amazing day because the sun was shining in Tavistock! I fed my trout and drove my youngest daughter Amelia to Looe for the afternoon and had a hot chocolate in a Café. We played in the arcade for an hour and then had a drive home for Chinese with Mark, Jack and Charlotte. It was a lovely day! January 26th was the day the work started on my new car park for OAPs and disabled people. Mark, Pete, Pete W and Reece had to cut trees and bushes and have a major burn up but it all took shape very quickly! February 4th was a very exciting day when Will Cann and his digger arrived to start work on all the repairs to our roads and car parks! There is something about a digger that I just love, I am not sure what it is really but I think it could be that they can change an area completely in only a few days. After only 3 days of working on my new car park Will picked up 29 loads of stone in his lorry and finished this huge car park! What a lovely car park it is now! It is now open and OAPs and disabled anglers are welcome to park there! February 13th saw 32 ton of pink stone delivered to our overflow car park and spread and rolled! Will Cann has yet again done an amazing job! February 16th was another fun day with 48 ton of tarmac delivered and spread in our main anglers’ car park. Will and his brother Phil Cann worked very hard to spread it with a few other chaps and finished just before lunch. Will Cann did an amazing job on all my car parks and I am sure that every angler and visitor will notice these massive improvements on their next visit! Thanks so much Will, you really are very handy with that digger! 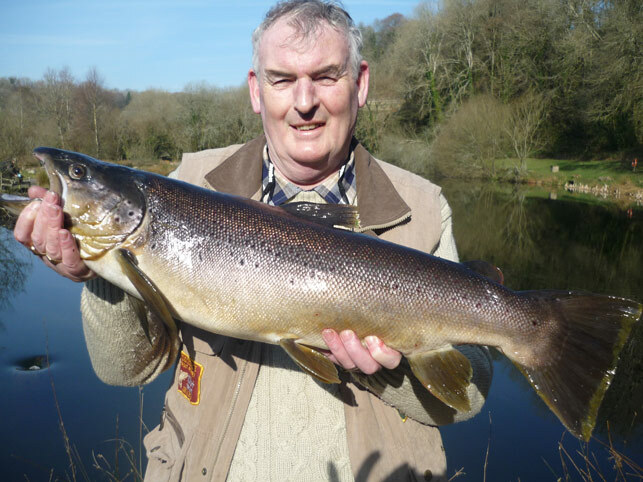 February 19th was a day that John Boyd, a local angler from Tavistock will remember for a long time! On a beautiful dry day and with a white and green catswhisker John managed to land this fine Triploid Brown Trout of 12lbs-5oz! Well done John, this fish is a true Tavistock specimen with perfect fins and tail! February 23rd – Andrew Younger from Plymouth caught a lovely Brown Trout of 9lbs-10oz with a catswhisker, but unfortunately didn’t inform a member of staff and so we have no photo. If you cannot find a member of staff, please do ring the fishery phone if you catch a large trout above 5lbs. Thanks so much! 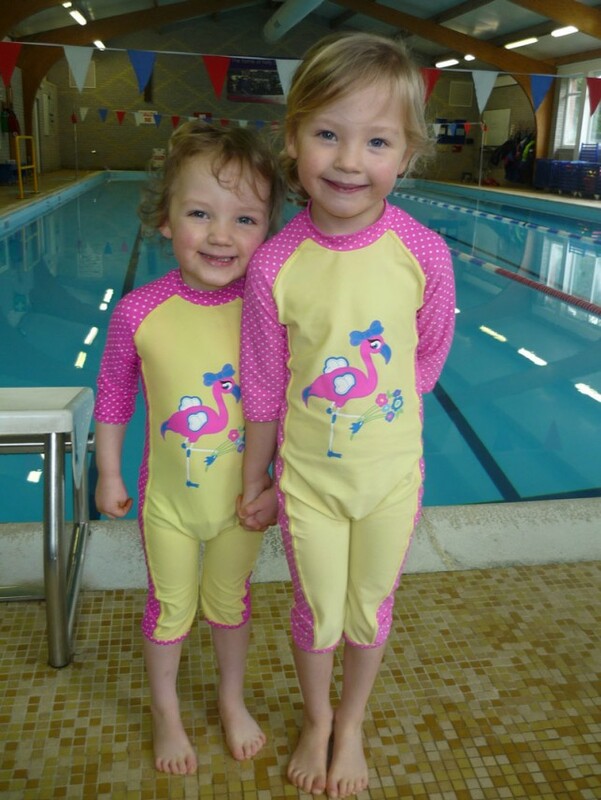 February 20th – Charlotte and Amelia were both so excited when I booked them a one to one swimming lesson at Kelly College swimming pool with Lindsay, one of the Kelly swimming instructors. Lindsay has been teaching Jack to swim for over a year and Jack has thoroughly enjoyed all his swimming lessons. Charlotte and Amelia were so excited, that they almost burst! We are hoping Lindsay will teach them on a regular basis, as they loved it so much! February 22nd was another exciting day when Jack’s results arrived from Kelly College to say whether he had been awarded a Scholarship. Jack is a very keen rugby and hockey player! I opened the envelope with great speed at 2pm and much to my relief he was successful and was awarded a Sports’ Scholarship! Jack has been at Kelly Prep for nearly 5 years and thoroughly enjoyed every minute of it; he is now looking forward to starting at Kelly College this September and to making the most of the wonderful opportunities that are on offer at this excellent school! You know when you have made the right choice with your child’s school, because they can’t wait to get out of the car in the mornings! My thanks must go to all the staff at Kelly Prep and of course, Mr Foale, the headmaster, for making Jack’s last 5 years so enjoyable! 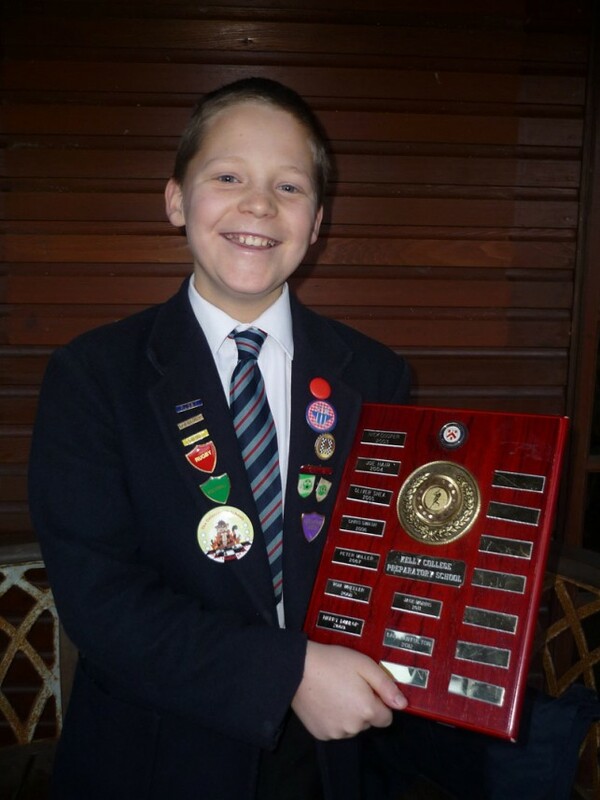 Jack is pictured below proudly holding the Year 6 rugby trophy that he was awarded at Kelly Prep recently. I am literally on the go every day doing the jobs of about 3 people at once! Either I am mad or just dead keen to make my business work in such hard economic times! Without me working as hard as I do, this business would not be a successful one, with my ever increasing running costs and to name just a few, fish food is now over £900 a ton, business rates £7,000, accountancy fees £5,000 and insurance £5,000 per annum. I can certainly see why some trout fisheries end up coarse lakes or even closed! Instead, my instinct is to not give up on what my late Father and I started on October 5th 1991 but to work harder and see it through these difficult times! So in truth I am a multi-talented woman who feeds fish, stocks lakes, looks after the animals, takes bookings, serves the anglers, deals with daily paperwork, answers the fishery phone 7 days a week every day until 9pm etc and most importantly is a mum and cooks a family meal every evening for Mark and my 3 lovely children! I suppose the bit I mustn’t forget to say is that I am pretty good at growing very large Rainbow and Brown trout too! With a fishery record of 31-11 and I was once the holder of the British Record for the Largest Cultivated Rainbow Trout in 1994 of 30-12 and it was unfortunately stolen from me by an angler who claimed it after this but in later years he admitted to it being a ‘nasty’ lie! March 1st 2013 – will see the two Osprey Lakes close in preparation for the larger fish being stocked and these lakes will remain closed until the 23rd March at first light! Our very large Specimen fish will be introduced to the lakes while these pegs are closed and allowed to rest and settle down to what natural food they can find before the 23rd March. Our once holder of the British Record Trout ‘Bertha’ was actually in Big Osprey Lake for 3 months prior to being caught, so be patient! Our Osprey Lakes have depths of water up to 18 feet and they are ideal lakes for the very large fish to hold up and make a new home. So start tying those special fly patterns and try your luck on or after the 23rd March! March 23rd 2013 – As you are probably aware, I am changing the minimum stocking size in all my lakes from Saturday the 23rd March and this will therefore bring a new tariff. I firmly believe that this new tariff is fully justified, not only with larger fish being stocked, but also with the amazing facilities we have here. To name just a few, we have a lovely new large OAP and disabled persons’ car park next to the lakes, newly tar-maced main car park, nice gents’ and ladies’ toilets, new lifebuoys, free tea/coffee making facilities, complete with a choice of complimentary biscuits and sometimes locally made cake too! I have been overjoyed to receive dozens of phone calls from anglers telling me that they are delighted that my big fish lakes are opening again on 23rd March and I would like to wish them all a warm welcome back! I am sure many of them will love my new car park beside the lakes too! ‘Free’ entry into our competition, free goodies, free lunch and free celebratory drink! Free bag of goodies worth over £25! To celebrate the change the fishery is going through on Opening Weekend (23rd & 24th March) all anglers fishing on a minimum 4 fish permit will receive a goodie bag, a free glass of Champagne or Beer and lunch at 1pm and free entry into our competition! The goodie bag will contain a new Tavistock Trout Fishery pen, Tavistock Trout Fishery Car Sticker, Tavistock Trout Fishery Key Ring, Tavistock Trout Fishery Bass Bag and Tavistock Trout Fishery Embroidered Cap! I am expecting all my new promotional items to be delivered prior to this weekend but should the delivery be late, they will be posted to every angler that had a 4 fish ticket on either the Sat or Sun. One goodie bag per angler. The 1st, 2nd and 3rd ‘4 fish’ heaviest bags on the Osprey lakes will each receive an engraved cut glass Tankard! 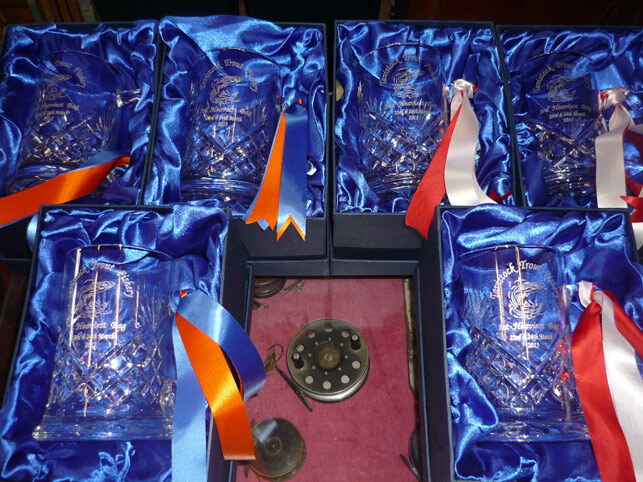 The 1st, 2nd and 3rd ‘4 fish’ heaviest bags on the Kingfisher and Heron Lakes will each receive an engraved cut glass Tankard! Well in these past 7 years since I closed my big fish lakes, I have been a busy Mum to my three lovely children and also a busy Mum to my monster brown and rainbow trout in the fishery stew ponds! Lots of love, good food and plenty of room are what grow healthy children and healthy trout! I have very large trout between 20lbs-33lbs now in my stew ponds and I am determined to use natural conditions, as I have always done to grow a British Record again! Everyday I am personally looking after and feeding my big fish and I want to reward every angler who catches a trout over 25lbs and so I am offering amazing prizes of ‘free’ holidays here on the fishery for 6 people for a week, to every fly angler who catches one of my home grown 25lbs monsters of the deep! No cash alternatives will be offered and these holidays must be taken out of our peak season in ‘Clearbrook Barn’. So come fishing and have a go yourself, and try to win a holiday for your fishing buddies or your loved ones! If you would like to buy a fishing permit for someone as a present, please visit the fishery or ring and pay over the phone. Cheques are no longer accepted in our office/tackle shop. March 23rd 2013 – Our Adult and Children’s Float Fishing Lake opens at 10am. This permit entitles the visitors to use our Children’s play area, trampoline, play barn, football area, Gazebo and outdoor seating area, Children’s Art and Craft room, feed our trout and our tea/coffee making facilities with complimentary biscuits in the lodge. As soon as our rare breed poultry paddock and new picnic area are complete this permit will also include use of these facilities. Please ring for further details or a brochure. March 23rd 2013 – Our new leaflets will be handed out to all anglers and visitors. We will have three new leaflets on this day, one will have full details of our new fly fishing pricing structure, the second will have details of our new Adult and Children’s float fishing visits and the third will have full details of our holiday accommodation. Please note the fishery will remain closed on Mondays through the summer (open bank holidays). Accommodation – Special 3 night offers! Fishing and pets are not included but all heating, electric, bedding and WiFi are! All dates subject to availability! As I said in my last newsletter these final finishing touches show that this fishery is not just an ordinary trout fishery but one that continues to invest in the ‘happiness’ of its anglers and guests! All fly anglers who want to experience a well run trout fishery and cast a fly in gorgeous surroundings are very welcome and of course there is the added bonus that you might catch a really big trout too! Visitors come here to relax and enjoy their day or week off from work and my job is to make sure that they do just that! To all my fly anglers across the globe I would like to wish tight lines and wet landing nets for the spring! To all my guests who come and stay here, I would like to wish you a drier spring and some warm sun! I look forward to seeing many of you during 2013 and I really do hope that lots of you will make the journey to my delightful fishery on our celebratory weekend in March! Those of you who would like to fish are welcome and those of you who would like to call in and pick up one of our leaflets this weekend are more than welcome too! If you would like one or all of our new leaflets posted to you, please ring or email me your postal address.